I’ve been proofreading the Genesis manuscript (for longer than I’d like to admit), and surprisingly, I’m finding myself implementing a really basic rule of the archive for more or less the first time. The only other handwritten works I’ve ever proofed or transcribed were all letters. Since letters are basically one of a kind, and there are few guideposts besides common sense to indicate what Blake is saying most of the time, if a word or a letter looks funky, I transcribe it funkily. The “transcribe what you see” rule is very straightforward in these cases. Obj. 3 line 6: It looks like there’s a space missing between “of” and “the”. Should we transcribe “ofthe deep”? No, because we can see that these are two separate words, and what’s more, we’d have to transcribe two words as one in almost every sentence throughout the work. Obj. 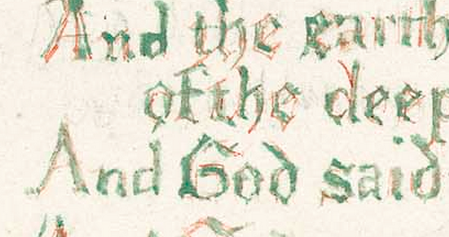 4 line 9: Here again, this “t” is missing its cross; should we transcribe it as ambiguous/ as an “i,” or note it? No, because the number of “t”’s missing their crosses might actually outnumber those with crosses. Wait, does Blake even know what a lower-case “t” looks like?! I think I have my dissertation project!!! Hopefully I won’t go mad with the power this proofing project is affording me before I finish it, but at this rate….